Today we have recieved this screenshot as one of our tips. 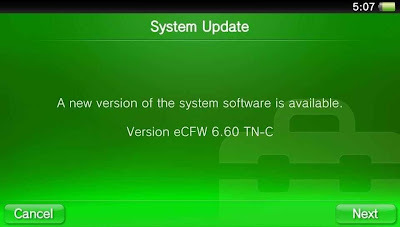 As you can see from this picture it is a screenshot of the PSvita System Information noting that it could be Total_Noob's latest installment TN-C.
As you can see it says a new system software is available making it seem as the PSVita had remotely looked a server (similar to the old PSP M33 days) and checked to see if the latest version of eCFW was installed. If only it was true other than that it is just a screenshot. Check out the screenshot above and feel free to stay tuned for more hacks and homebrew news.